Thanks to one of our Fabulous Finders, Kate has found this doll, but Lily is still looking for one. 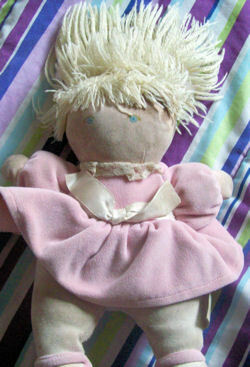 I’m looking for a blond Eden wind-up doll that plays “You are my Sunshine”. It’s not the elephant- it’s a doll in a pink dress with yellow yarn pigtails. She has a white ribbon on her dress, and she is about 15 inches long. My daughter has one of these dolls and has had it since she was born. But I would love to surprise her with a new one! The one she has now is very beat up. Buy it now 24.99 with 5.35 shipping. You were busy last night, Susan. THANK YOU!!!! I’ve emailed them both.